The holidays are just around the corner and I know you may be brainstorming about how to earn extra cash for Christmas. We're in October now, so there is still some time! Below, I've created a list of the best 25 ways I could think of to earn some extra money now. And when I say “extra money,” that is exactly what I mean. These ideas likely won't replace your day job if you have one, but they should be easy side earners to fit into your daily schedule. If you are in need of an actual work from home job before the holidays, you should check the work from home job leads page to see what companies are needing help right now. I've also created a list of 13 companies that are currently needing work at home help for the holiday season. Rewards sites are very popular online right now because they make it super easy to earn a little extra. Most of them will give you redeemable points or cash for doing things like short tasks, printing coupons, searching the web, playing games, offers, surveys, and any number of other things. Swagbucks – Pays usually within 10 days, often sooner. The Penny Hoarder has a great post you can check out with more info on how Swagbucks works. Prize Rebel – Pays within 24 hours in most cases. You can redeem for cash, Paypal, and various gift cards. InstaGC – If you redeem for an Amazon (or any other type) of gift card, you can get it as soon as you redeem it. Absolutely no waiting at all. Survey panels are also good for scraping up occasional extra money. After you've registered with the below panels, you should get occasional survey invitations to your email. The panels below are known for paying quickly and they have low cash-out thresholds. This is ideal if you are trying to earn extra cash for Christmas. Opinion Outpost – Most of the time you only have to wait a few minutes to get your rewards from Opinion Outpost once you redeem. Also, the cash out is just $5 for Amazon codes and $10 for Paypal. Pinecone Research – This one is a very reputable company that's been around for years. However, they can be pretty picky on who they accept and are not always open to all demographics. They pay $3 per survey and you get paid typically within a few days after you take a survey. Mindfield – This one pays in cash, not points. If you opt for Paypal payments, you can expect to receive them with 5 to 10 business days after you redeem. You can use Slice the Pie to earn extra cash for rating and writing short reviews for new music. It's easy, but take care to make sure your reviews are very detailed and well-written. You can redeem as long as you have $10 earned, and pay outs are made on Tuesdays and Fridays with Paypal. Install Qmee in your Chrome, Firefox, Internet Explorer, Safari, or Opera browser, and then just sit back and use the internet as you normally would. When you search for things on Google, Bing, Amazon, Qmee will occasionally pop up in your sidebar with some sponsored links. And every time you visit a sponsor, you'll earn anywhere from two to fifteen cents (most seem to pay around eight cents). Qmee pays instantly when you cash out with no minimum required for redeeming. You can get paid quickly for doing short, 15-minute usability tests for companies that need their websites evaluated. This involves speaking into a microphone from your computer and navigating around the websites you're assigned, stating what you like/don't like about the usability of the sites you test. Most of these tests pay you around $10 to $12 each, and you'll have to watch your email for invites to do them. Some sites to sign up with for this are User Testing, Userlytics, and What Users Do. Want to join even more user testings sites? I have a full list of website testing companies you can check out for more. If you have a smartphone, you can download the Ibotta app and begin earning cash back on many grocery purchases. Simply check to see what the featured products for the week are and how much they pay if you buy them. You'll probably also have to answer a short survey or watch a video about the product. Then, scan your grocery store receipt proving that you bought the item(s) and Ibotta will pay you cash. You can redeem your earnings at just $5, and the money goes instantly into Paypal. Trust me that this adds up if you use it every time you shop. Use Amazon mTurk to get paid for doing short tasks. They have all kinds of little odd jobs posted, including data entry, surveys, transcription, and more. You only need $1 to request payment to your bank account or you can just use the money to shop at Amazon. Another reputable site for short tasks is OneSpace. There are some easy to use apps out now that you can download and get paid for doing little odd jobs around your town. Example – taking pics of displays in stores, answering surveys, evaluating your experience at various businesses. Kind of like mystery shopping. Also, many of these apps will pay within just a day or two after your tasks have been approved. Some to try include Field Agent, Easy Shift, and GigWalk. Did you know that you can trade in your electronics, books, movies, video games, music, and iPhones to Amazon? And you don't have to have purchased the item from Amazon originally to trade it in. Amazon will tell you the amount they'll give for your stuff after you submit it. Then, once you've shipped it to them (free), they will send you an Amazon gift card for that amount. Go here to submit your items or read our review of Amazon's trade-in program. If you are crafty and you can make stuff that will sell, you can easily sell it online at Etsy. The great thing about Etsy is that, as soon as your item sells, you get paid to Paypal. There is no waiting on your money. Etsy does charge a very small listing fee per item. Go here to visit Etsy and get an idea of what you could sell. I also have a list of other places to sell your crafts if you want other options. Smartphones are getting so advanced that many of them are actually capable of taking decent quality photos. So good in fact, that there are sites that will buy them from you! If you're a good smartphone photographer, you can post some of your pics up for sale at Foap, Scoopshot, and Clashot to name a few. Most cities have a virtual yard sale group or page on Facebook where you can buy, trade, and sell items with people in your local area. This is a way to earn extra cash for Christmas if you have a lot of stuff you want to unload quickly. Just do a search on Facebook for “(name of your town) online yard sale.” If nothing comes up, try the name of neighboring town or even the name of your county. If you know English, you can earn money chatting online with others who are trying to learn it through a site called Cambly. You don't need any teaching experience, and you can work whenever you want. You will need either a computer with a webcam or a smartphone with recording capabilities to do this. They pay .17 per minute of talk time, and you can get paid twice a month with Paypal. If you have some experience in teaching or tutoring and a degree, VIPKid is another option that I'm hearing good things about from readers. If you have at least average writing skills, there are a few sites you can apply with online and get paid to do ghostwriting. If you're not familiar with what ghostwriting is, it's basically getting paid to write content for people who need it. You get paid, but you don't get credit for writing. One popular sites like this that tends to have lots of work and pays weekly is Textbroker. Swagbucks (mentioned above under rewards sites) happens to have a very lucrative little app called Swagbucks TV that you can download and watch videos on. It's possible to earn up to 50 Swagbucks a day watching videos via their app, and then you can earn an additional 150 Swagbucks per day watching videos via Swagbucks on your desktop. That's 200 Swagbucks per day just for watching videos, and it only takes 450 to get a $5 Amazon card — so do the math. It should be possible to get at least $20 in Amazon codes per month just watching videos. There are a couple of sites that regularly need researchers to work at home. And while this is just extra money for most people, it's not shift-based work. You're an independent contractor and you can work anytime you want, which makes it ideal for building up cash for the holidays. Two sites that are regularly looking for researchers are Wonder and Hobby Jam. If you have any used textbooks laying around that you don't need, there are several sites that will pay you pretty quickly if they can use them. The books will need to be in excellent or good/gently used condition to be accepted. Some good options for this include Cash4Books, and eCampus. Note that Cash4Books may also accept other types of books — not just textbooks. You can sell your old iPhone — or any phone — and earn some money whether it's in working condition or not! There are many sites that will pay you for your outdated phones and they don't all pay the same. I recommend using Gazelle. Mindswarms is a reputable site that pays $50 if you qualify for and complete their mobile video surveys. I believe that most of the time they send payment via Paypal within 24 hours after you've done a survey for them. I have not used this site myself, but many of my readers have and claim to have been paid. There's no guarantee how often you'd get in on a study, but it's a quick and easy $50 if you do get in on any between now and Christmas. Ride-sharing apps are HUGE right now. Everyone is catching rides with services like Lyft and Uber. You can actually sign up to drive with Lyft and/or Uber and earn in your spare time giving rides to people in your local area that request them via the app. This is a great idea for Christmas earning because you can drive whenever you want to. Want to earn extra cash for Christmas and don't mind leaving your house to do it? You can also earn some extra money doing some in-person mystery shopping. You'll most likely get invited to do more shops if you live in an area where there are lots of stores, so if you live in a very rural area, making money with this will require some travel that may or may not be worth it depending on the price of gas. There are lots of mystery shopping scams out there, but some reputable mystery shopping companies you can feel safe applying to include Market Force, A Closer Look, The Source, and BestMark. It happens to many of us — you get the wrong color by mistake, or a product just doesn't work for you as well as you thought it would. If that's the case, you can use sites like Glambot or MUABS to unload them and earn money. We have more info on where to go to sell your makeup if you're interested. There are a lot of people out there these days who are taking advantage of various apps that allow you to place restaurant/fast food orders from businesses in your town and get them delivered straight to your door. As a result, these apps need delivery drivers, and that's where you can come in! Sign up to deliver with services like Uber Eats, DoorDash, and Shipt and deliver whenever you want, getting paid daily or weekly for delivering food and groceries to people who request it via the app. If you're like me, most of your kid's outgrown clothes get sent straight to the goodwill store. However, if you have any that are in good or very gently used condition, you could send them to ThredUp and get paid for them instead. The way it works is you have to order a bag from them, stuff it with the clothes you want to sell, ship it to ThredUp (the shipping is pre-paid) and then wait for them to appraise your items. Once they have, you can get in cash the amount they think your clothes are worth. You don't have to have a teaching degree to get paid for sharing your skills with others. The internet is also filled with ways to do this. One way is to spend time creating an online course that you can sell over and over again at Udemy. You just create the course, and they provide the platform and tools to help you get it sold. 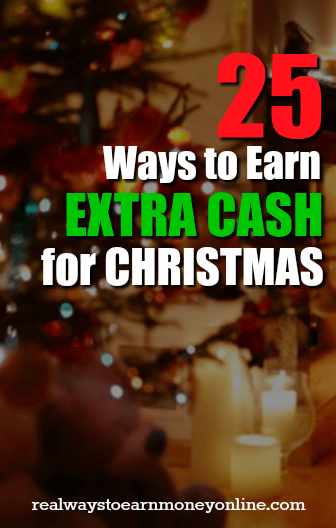 This is a great way to earn extra cash for Christmas. First off, my sister has a blog called Extra Cash & Rewards where there are many reviews and lists posted for things like survey panels, smartphone apps that pay, product testing sites, and more. That site has been around since 2011. There are a lot of posts, so you may find some more ideas there. Second, I have found a little gem in the “Beer Money” sub-Reddit on Reddit. This is a very active community filled with people who are looking for extra money. These people have not only great ideas for getting it, but also strategies for making those great ideas work. Many apps and sites I listed above are mentioned there, along with tips for making the most of them. Definitely check it out. I genuinely hope this post has given you some ideas to earn extra cash for Christmas! Every little bit you can earn will help! This post was originally published on 10/8/2014. Updated and re-published on 10/3/2018. I’m sure there are folks out there already making plans for holiday shopping and earning cash to do it. Thanks for sharing these ideas. Thanks as always, and you too! Wow!! Thanks for so much useful info! It’s great to finally find an article that has links to sites that are useful not dead ends for a change. I’ve tried so many that turned out to be such a waste of time. These are actually worth doing. I had almost stopped reading blogs and posts about making extra money or working from home because every one I tried was so disappointing. You’ve restored my faith in online money making. Yea!! and Thanks!! Thanks, Renee! I’m glad you find it helpful. I hope some of these work out for you! Hi, I was wondering if you have personally tried slice the pie. I googled reviews one time and someone said they are a scam. I have done it but I stopped because of the reviews. Thanks. Yes, I have used them and still do on occasion. They are not a scam at all. They will pay via Paypal on Tuesday or Friday if you cash out your earnings (you need at least $10 to cash out). They will close accounts and not pay users if they attempt to game the system by leaving thoughtless reviews that are too short. There are a lot of people who have gotten upset when this happened and tried to call Slice the Pie a scam. You should be able to find plenty of other testimonials online, along with payment proof, that they’re not a scam. I believe I have payment proof posted as well on my Slice the Pie review here – http://realwaystoearnmoneyonline.com/2011/06/get-paid-to-listen-to-music.html I’ve been using them since 2011. Awesome, I’m going to send some of my members at koodus.com this way! Thanks for a great article! Nice info… Can you recommend me a good survey site which is genuine and I can earn online? I must agree with all of the comments full of praise for you and this list. I too have previously tried to navigate the waters of this subject, with absolutely less than stellar results. Though I have not taken the time to actually follow-up and visit any of these what I hope to be realistic alternatives for extra income websites, I can only hope that what I’m met with at those I will have the time to try (or at least visit/research) turns out to be even 75% as good as you seem to make them all sound! I am loathe to admit that I have only recently begun to “embrace” the technology that has become the very pulse and lifeblood of society; as a result of my naïve rebellion, I am far behind my contemporaries in virtually all aspects of incorporating this way of life into my routine(s). However, with the help of very well researched and incredibly informative sites like your own, I am confident I will find my way. Thank you again for helping a stubborn late-bloomer find, for once, useful information at my fingertips; it’s extremely refreshing to not be given the proverbial run around. Wow! That is an awesome list, Anna. Some things I’ve never even heard of. Let me be very honest, this isn’t the first post/article that I am going through that talks about ways to earn extra cash. I have been reading similar kinds of articles every now and then. I personally like your article a lot. Most of the authors just end up writing a generic post with so-called pretty much known ways to earn money but you did your homework. Your post is fully packed with useful and unheard kind of ways to earn money. I must say I am impressed. With 1Q they do not pay a dollar per question answered. The dollar is what the person submitting the question pay per response they receive. 1Q pays either .25 or .50 per question answered through your cell phone. I have been with them a little over a week and while it’s been a slow start I have answered a few questions and have been paid by them. Another option but this only works if you do not have a Amazon MTurk account is to join Crowd Source and take one of their qualification tests. Once you pass they will send you information on how to log in, etc. I have an account with them and have done tasks and been paid the same day through PayPal. Yay! 🙂 Love Crowd Source! Oh darn! I got them confused with PollBuzzer. I’ll go edit that. Thanks Cheryl! Awwwww I’m sorry Anna! 😉 You do such great posts and so packed with information if anyone can’t find a job on your blog than one isn’t out there for them yet. Thanks so much, Cheryl! I appreciate the kind words very much!